Attorney-General and Minister for Economy Aiyaz Sayed-Khaiyum (middle) looks on as Fiji Link general manager Athil Narayan (left) hands over the flight tickets to Vodafone Festival of the Friendly North president Subhash Chandra at Subrail Park in Labasa. Photo: Shratika Singh. One-third of all seats on all Fiji Link flights between Suva and Labasa and Labasa and Suva are selling at $65. 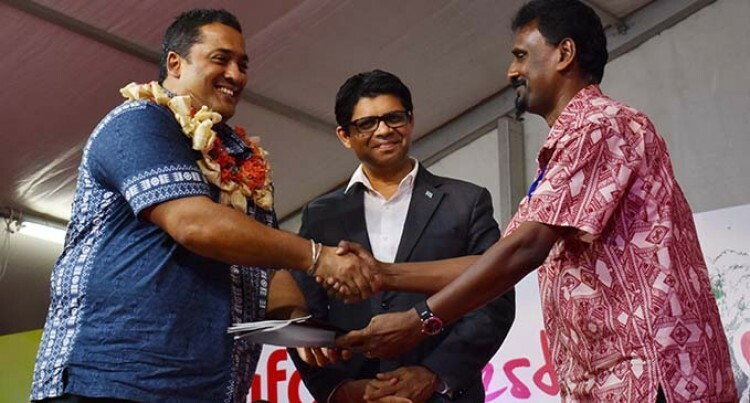 Attorney-General and Minister for Economy Aiyaz Sayed-Khaiyum made the announcement during the Vodafone Festival of the Friendly North at Subrail Park in Labasa on Friday night. “The $65 fare is excellent news for the people of Labasa and Vanua Levu as a whole,” Mr Sayed-Khaiyum said. “These low fares will allow more Fijians in Labasa and the capital visit each other more frequently. “Labasa students will find it easier to get to and from their tertiary institutions in the Central Division. “A lot more people, including tourists, will now fly from Suva to Labasa and also travel onward to other destinations like Savusavu. “I would like to thank Fiji Link for introducing lower fares on its flights. “The multiplier effect of this announcement is quite significant and complements the Fijian Government’s efforts to further spur economic development and growth in the North. “The low fares, upgrading of Waiqele Airport’s terminal and installation of night lights on the runway, will boost commercial activity and business opportunities. Fiji Link General Manager Athil Narayan explained: “The low fares came about as a result of regular feedback and engagement with communities in the North. “We have upgraded the ATR fleet operating between Labasa, Suva and Nadi with modern, comfortable and extremely reliable aircraft. These fares are now on sale and will be available until Fiji Link completes a review to add more capacity into Labasa. Fares increase to higher fare buckets once the $65 seats are sold out on respective flights. Fiji Link flies its ATR aircraft three times daily Suva-Labasa-Suva.